The basic premise of chiropractic is that if you remove interference to the nervous system, the nervous system will then heal the body. We learned how to identify the exact subluxation, correct it with a precisely delivered vertebral adjustment, and verify it was corrected. When the patient got up off the table, he was healed. When you checked him the next week, it was holding. Too often these days, even though we give the best possible adjustments, the correction doesn’t seem to hold nearly as well as it used to. So, what changed? D.D. 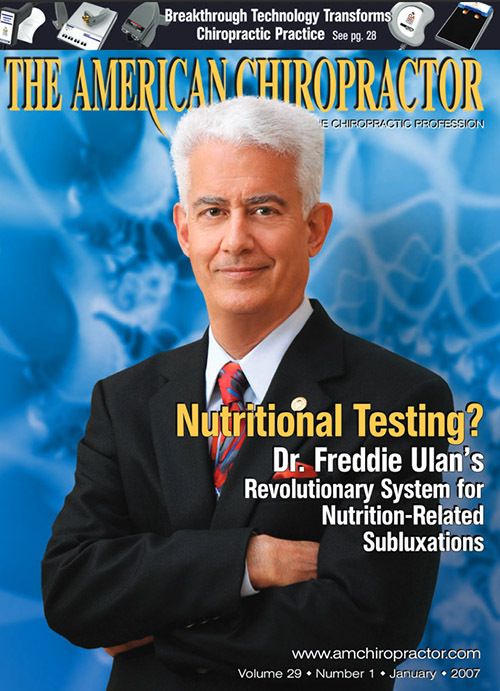 Palmer talked about primary subluxation by injury or accident, and secondary subluxation caused by toxicity, nutritional deficiency and stress. The recurring, or secondary, subluxations were not emphasized in my training, yet the majority of patients we see today are afflicted by them. Bodies are not healing themselves like they used to because we have a deterioration of the food chain. And we have a huge increase in the intake of those things that literally prevent the body from self-repairing. D.D. Palmer gave us the miracles of chiropractic, and laid the groundwork for a science to restore cellular integrity after it was lost through nutritional neglect or toxic damage. Which systems were urgently in need of support? What exactly did they need first, and in what dosages? To answer these questions required the evolution of a precise testing system, built on the pioneering work of Frances Pottenger in the 1930s, Royal Lee in the 1950s, and a handful of others. The technology is complete, and the results are unvarying given proper training. Qualified practitioners can assess the status of the autonomic nervous system and design a precise nutritional program that will rebuild the compromised systems in the sequence dictated by the body’s needs.